Good afternoon, Insiders. It’s been a busy day. Let’s do this quickly. -The vitals: Jack Campbell exited the ice first and is expected to start in goal. He has faced Arizona once in his career and stopped 26-of-29 shots through overtime and three of five in a shootout in a 4-3 loss at Gila River Arena on March 13. Andy Andreoff, Paul LaDue and Michael Amadio remained on the ice for extra work and are not expected to be in the lineup tonight. -Their vitals: Darcy Kuemper – a not-so-secret weapon Minnesota used to utilize against Los Angeles – will start in goal for Arizona, Rick Tocchet confirmed. “Looking for him just to be in a solid situation for us. Kuemps has done a good job for us,” Tocchet said. He’s 3-1-2 with a 2.33 goals-against average and a .924 save percentage against the Kings in his career and has gone 2-5-1 with a 3.16 GAA and a .897 Sv% since joining the Coyotes. Defensemen Niklas Hjalmarsson (lower-body) and Jason Demers (upper-body) and forward Laurent Dauphin (lower-body) are out for the season. Tocchet, on the Kings: “Theyre good at taking the walls away. They’re a good wall team. They keep pucks in at the blue line, they’re good in the corners, they go to the net hard. So when you play teams like that, you’ve got to really utilize other parts of areas of the ice. You’ve got to pass the puck well, and then you’ve also got to be able to battle with ‘em.” This is the Coyotes’ sixth and final game of a road trip that opened in Buffalo on March 21 and has recently resulted in back-to-back wins over Tampa Bay and Vegas. They’re 15-8-2 since their 6-0 loss at Staples Center on Debruary 3, a defeat Tocchet that Tocchet said the team was “embarrassed” by earlier today. That's back-to-back wins for the Coyotes over division leaders: Tampa in the Atlantic, Vegas in the Pacific. 15-7-2 since Feb. 8.; 18-12-6 in 2018. 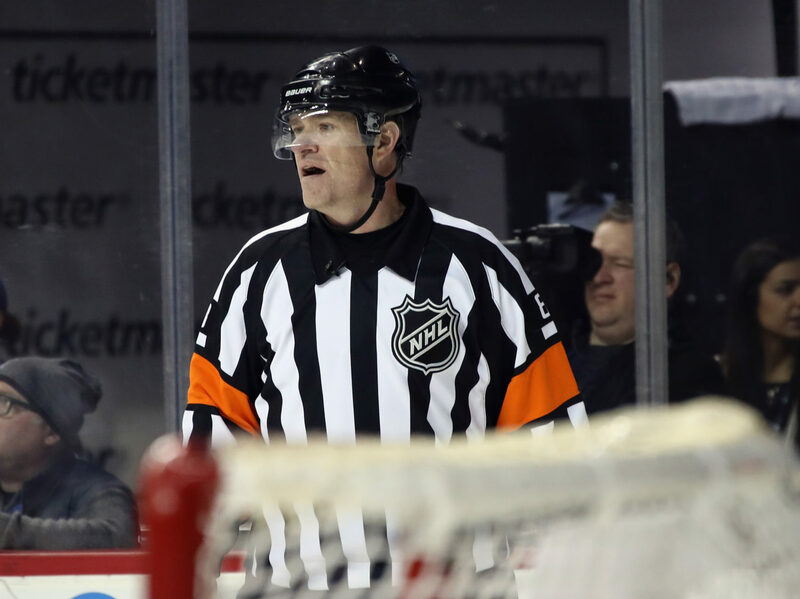 -Stick taps and happy trails to referee Dave Jackson, who will officiate the 1,548th and final game of his career tonight, per the NHL. Jackson, who has also officiated 83 playoff games, served as an on-ice official for the 2002 All-Star Game in Los Angeles, the 2018 All-Star Game in Tampa, the 2016 Stadium Series game in Denver and the 2014 Sochi Winter Games. The Kings will also present him a special bottle of wine before the game. Shane Heyer, whose final game as an NHL linesman is tomorrow in Anaheim, will also be recognized by the club with an informal gift. I think they’ve got four lines going right now. For the type of year that they had, it was just so frustrating, and now the last three, four weeks, they’ve just been playing a little bit freer. As a result, I think they’re making more plays. But, I think ultimately when you look at the difference from a few weeks ago to maybe six weeks ago, I think their defensive game has gotten a lot better. They’re more solid, taking care of the puck. [Reporter: Derek Stepan a big part of that, too?] He’s a good, solid player. I mean, if you look at their team, he brings a good, veteran presence. We’ve got two big points on the line tonight, and we really need those points, so we’re going to do everything we can to get those two points and be ready to play a good game tonight. They beat us last game, so we’ve got a little revenge to take out on them tonight. I would say no. They’re really good at handling the puck, I think we saw Jack in the three games he’s played, he’s moving the puck really well. He’s making really strong plays with the puck. He’s really poised, too. You can tell that he has experience playing the puck a lot, but at the same time, you have to make sure you have to call us out early and give him time to get ready to make those plays. But he’s a tremendous goalie, and it’s fun to have him back there. Yeah, absolutely, and even the first game in Vegas, too, it really set a standard for the way he can play. It’s fiun to see. I’ve watched him through his career – he’s played with a couple of my friends (Zack Kamrass, John Klingberg) over the years, so I’ve had an eye on him ever since he played in World Juniors, so I’ve known about him. I’ve played against him in Texas, too, when I was in Iowa, so I know he’s a good goalie. It’s fun that he’s getting the chance, and he’s really shown that he’s an NHL goalie. -Tonight’s officials are referees Marc Joannette and Dave Jackson and linesmen Pierre Racicot and Lonnie Cameron. Jeff Gutt, who now provides lead vocals for Stone Tempe Pilots, will perform the national anthem. Let’s talk soon, Insiders.